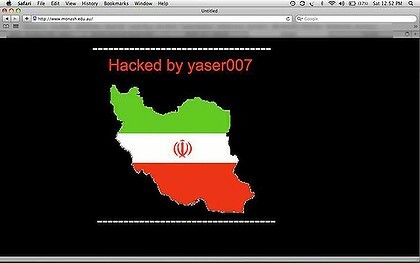 Monash University has reported to "specialist agencies" the hacking of its website home page, which on Saturday displayed the words "Hacked by yaser007" in red above a picture of the Iranian flag within the outline of a map of the country. In an emailed statement on Sunday, Monash University chief information officer, Mr Ian Tebbett, said the site "was subject to an external hacker breach on Saturday" but that "the situation was quickly identified and dealt with". He said no university data had been compromised and that the effects were "limited to the publishing of non-Monash material on the externally-facing website". It appeared, Mr Tebbett said, that neither Monash, nor the wider Australian higher education community, were a "specific target of the attack". Monash's own investigations of the matter were "ongoing", he said. "We take the matter of security of all our IT resources very seriously and strive to balance the risks involved with the benefits gained from these resources." One screengrab supplied to Fairfax by a student of the Victorian university showed the Monash website remained hacked at 12.52pm on Saturday. Shortly after, the website returned to normal. Mr Tebbett said that between 12pm and 2pm on Saturday "users may have seen alternating correct and incorrect presentation of the website" while Monash's ITS department resolved the matter. The hack appeared to not only affect the university's home page but also access to other parts of the site, including the university's library and Faculty of Engineering websites. This isn't the first time a hacker has targeted an Australian university's website. In January, a hacker who nicknamed himself "Evil" sabotaged the University of Sydney home page and altered corporate webpages. The University of Sydney called in two internet security firms after the incident occurred to beef up protection from hackers.